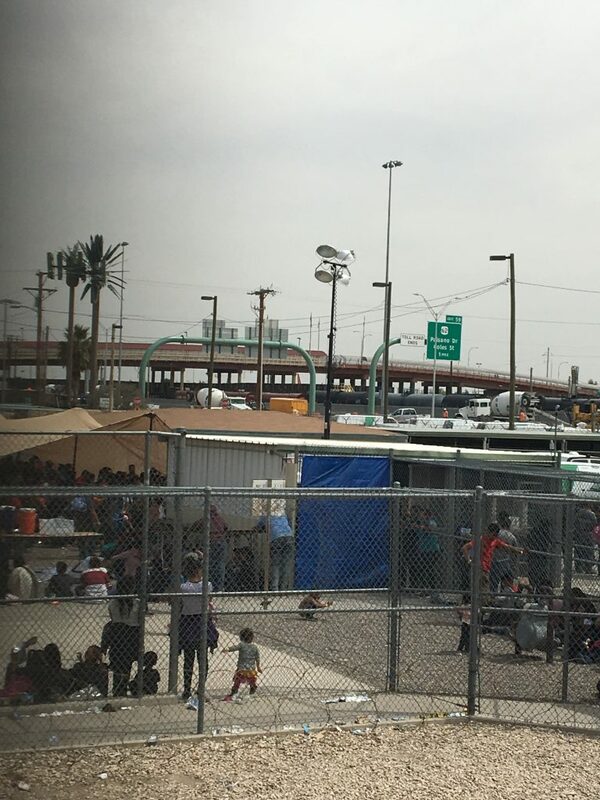 On Day 3 of our border trip to El Paso, we visited a migrant shelter in Ciudad Juárez, crossed the Paso Del Norte International Bridge back into U.S. soil, and then took a bus to see a New Mexico segment of the current “border wall” built years ago. 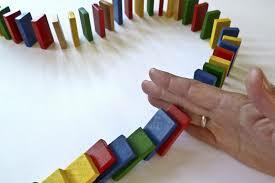 Everywhere we went, the message I received was that actions have consequences. 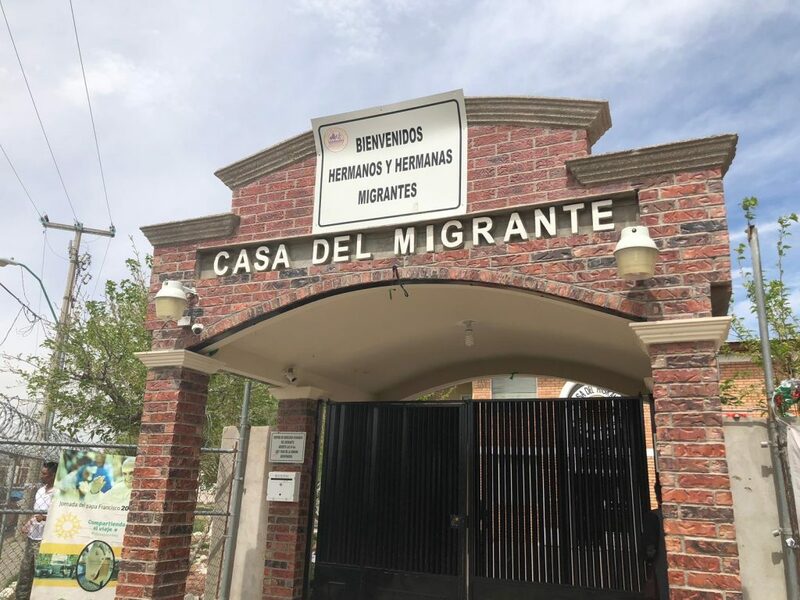 Casa del Migrante has a sign on top saying “welcome, brother and sister migrants.” This is the main migrant shelter, with 485 men, women, and children staying there on the day we visit. They house people temporarily (from a few nights to over a month) from three kinds of circumstances: (1) those who have been deported after living many years in the United States; (2) those who have been displaced from their countries of origin and who want to stay and work in Juarez; and (3) asylum seekers who have been directed by US Customs and Border Protection (CBP) to await processing. 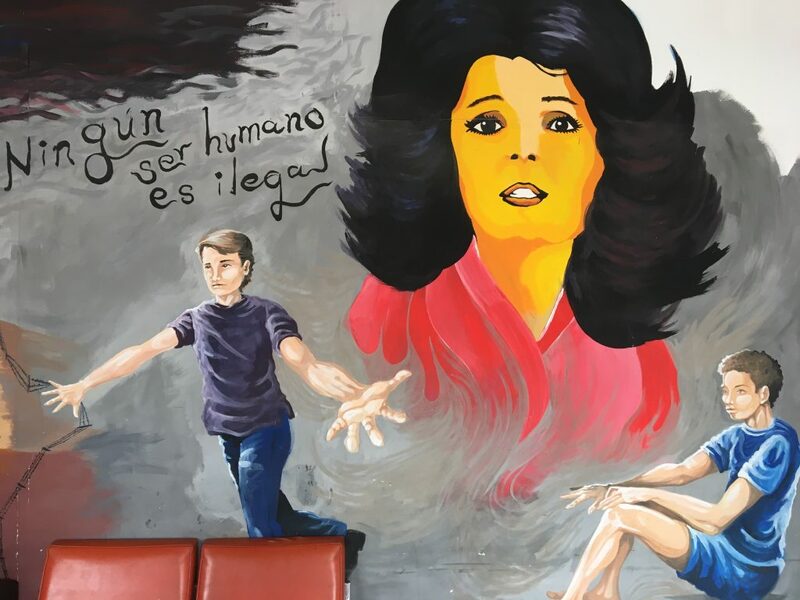 The trees, space, freedom of movement, and people doing laundry made Casa del Migrante feel homey, in stark contrast to the prison-like Otero detention center. 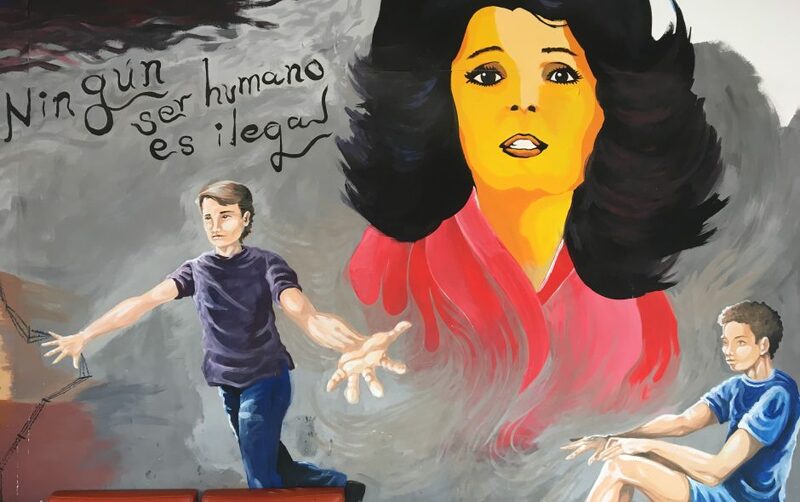 “No human is illegal” mural in Casa del Migrante. 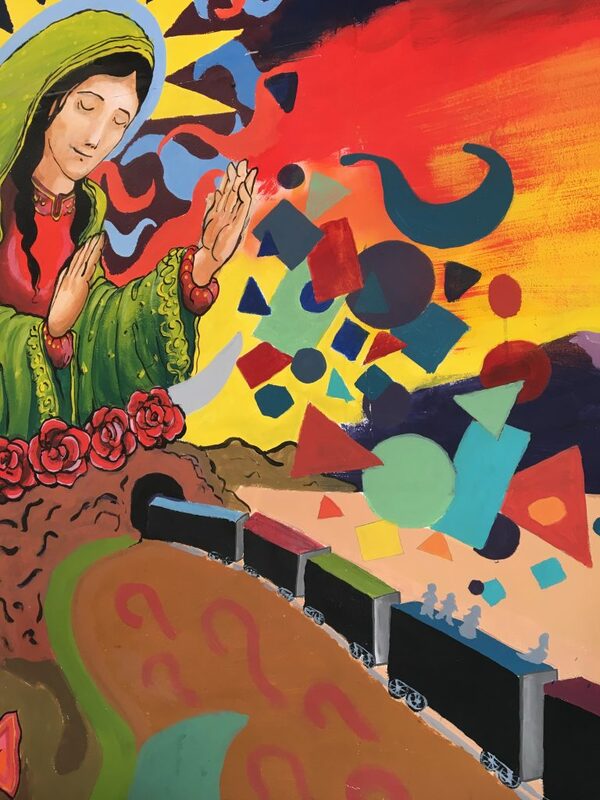 A mural of La Bestia, “The Beast”, a reference to the network of Mexican freight trains which sacrifices safety for speed in bringing Central Americans up through Mexico. We were told women with young babies strapped their children to them tightly so the bouncing cars wouldn’t cause the young ones to fall off to their deaths. In the mural, the Virgin of Guadalupe looks over the passengers, and represents faith in the journey. After we got back on the bus, one of my colleagues told us of a conversation with one of the migrants at Case del Migrante. The woman, Sofia, was from Honduras, and when she heard we were a group of Jewish clergy, she said, “Shalom!” It turns out she was Jewish, a nurse back home and relatively well off. But after reporting stolen medical equipment (perhaps by gangs or by bribed officials, I couldn’t tell), her life was threatened and so she fled with her 13-year-old son, who was going to have to miss his Bar Mitzvah. Actions have consequences. Many were fleeing the cruel consequences of gangs and criminal elements in their countries of origin. 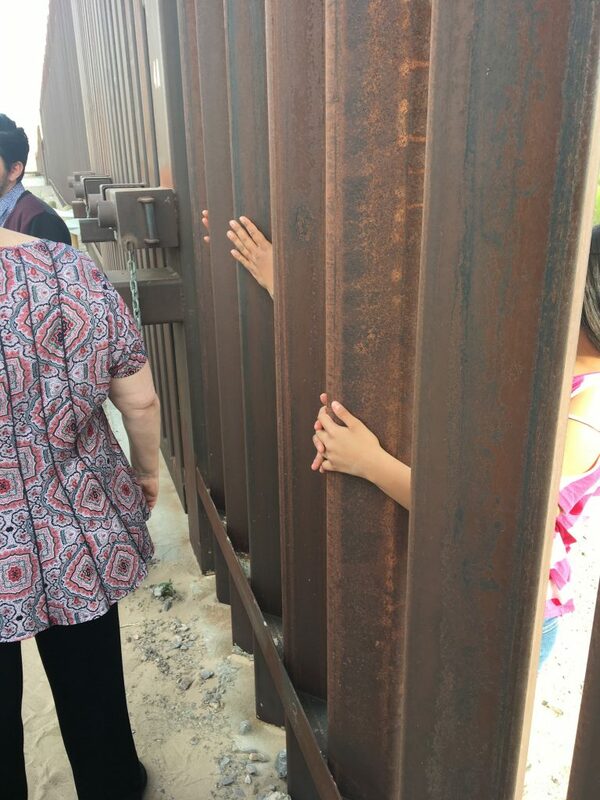 As we crossed the bridge that connects El Paso and Juarez, I peered through the slatted bridge railing. You may see in the news that many asylum-seekers are being held under this bridge. Here are more professional photos. CBP has run out of space to hold people. 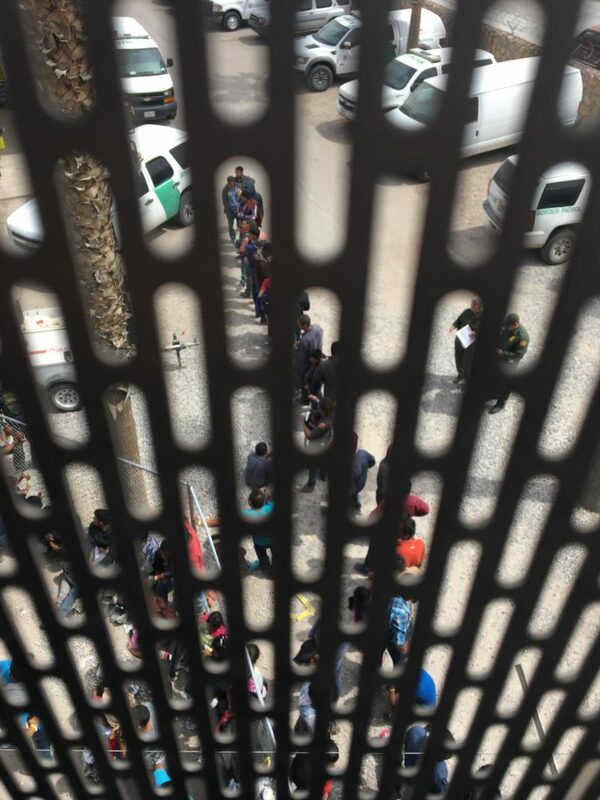 Some of the people we were with wondered whether the consequence CBP seeks by publicly displaying this humanitarian emergency is a perception of hordes crossing and more support for building yet more detention centers and ultimately a forbidding wall. What I see are desperate people seeking safety and a better chance at life. I see a failure of our immigration system to recognize refugees. Our next stop is at the point where Texas, New Mexico, and Chihuahua meet. 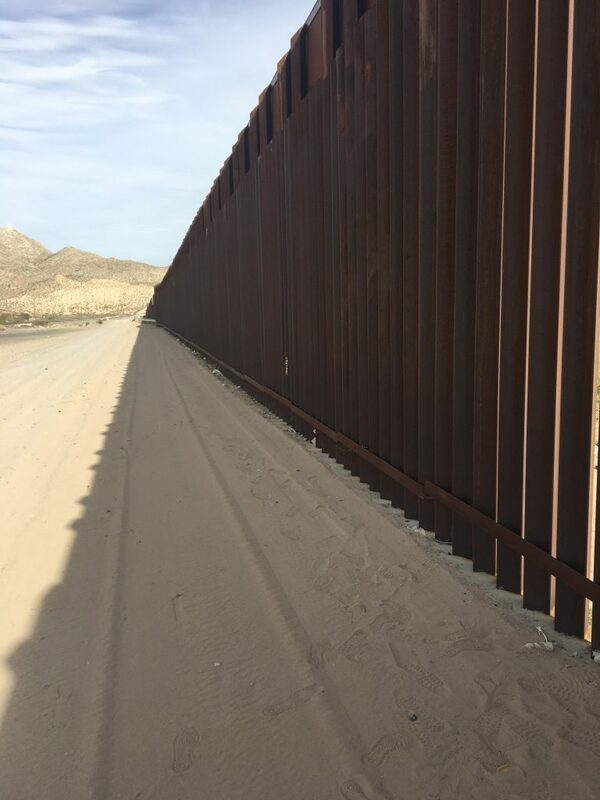 We see a stretch of border “wall”, actually massive slatted steel fencing. Twenty-eight feet tall. Five miles of this along the border currently. On the other side are houses and a number of families, a very poor outpost of Juarez. 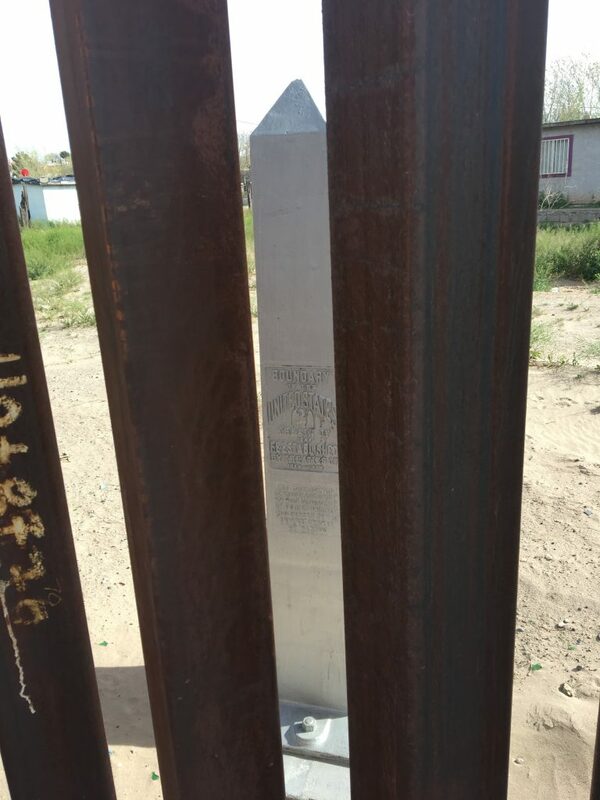 At one point four kids are touching the obelisk that formally marks the border with one hand and moving clockwise, a simple game of who lose touch first. I take it as a reminder that when I leave this region, I too should not lose touch. Even a steel fence with slats casts a solid wall of shadow. While we pray Mincha, the afternoon prayer, nearly a minyan of Mexican children stand on the other side of the wall. While we sing Oseh Shalom (One Who Makes Peace), one of the boys asks “One dollar please!” Sadly I don’t have a dollar. But when another boy loses his tennis ball and in the midst of prayer it bumps against my feet, I take a moment to kick it back to his country. It turns out that not too far from where we were, a militia group, the United Constitutional Patriots, have been watching us. They are heavily-armed, ex-military, standing vigil until the wall is built along the full stretch of the border. Definitely terrifying. Although I wonder now if there is a website where you can press a button and get your “white nationalist terror organization name” by random. Actions have consequences. 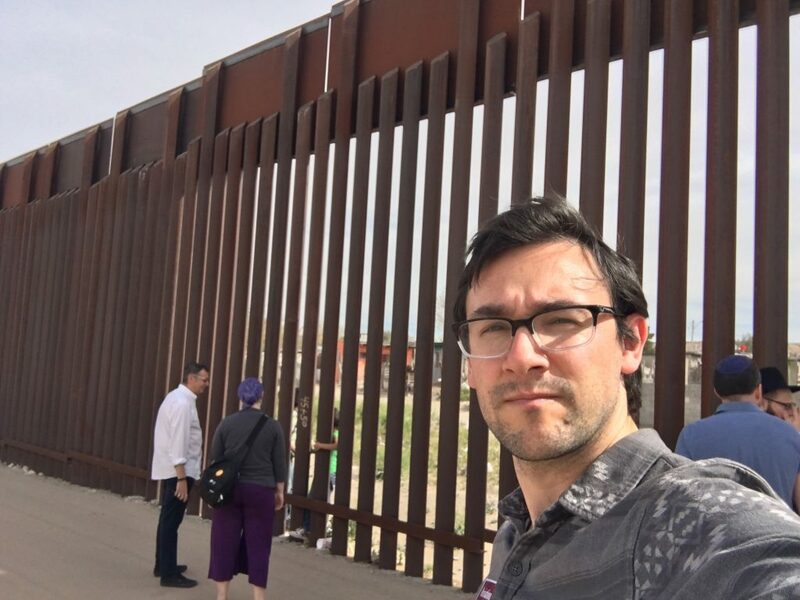 I’ve just started to learn about the connection of this wall and U.S. economic policies. The wall was begun at the same time as NAFTA was created and which was built to this height during the Obama administration. Here’s an excerpt from this 2016 article that traces a little bit of the history of the wall. 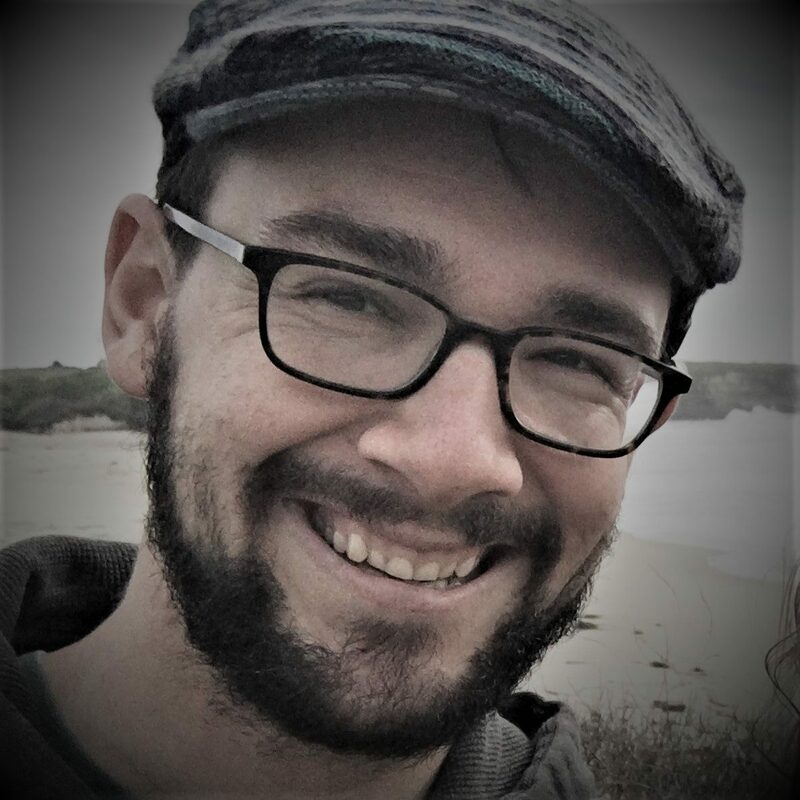 I’m about to fly back home, and continue to ponder what I’ve witnessed, what I’ve learned and have yet to learn, and how to act locally to do what I can for more justice and kindness in a complex and painful system. There are many ways you can help too. Here, I’ll just list three opportunities if you feel so moved. And perhaps our actions will have consequences, too, in shaping the America of our greatest aspirations and ideals. Learn – just ask, “Why do people come?” Research, ask friends, find experts, listen to personal stories, think it through. Learn your own family histories of immigration. 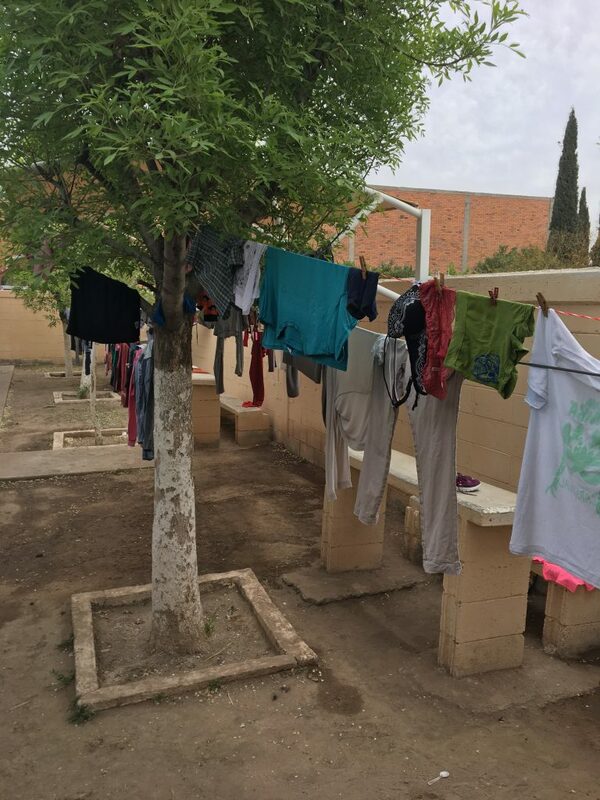 Donate – Annunciation House does amazing work in the El Paso district taking almost all of the people the ICE or CBP releases to the streets and housing them, feeding them, and helping them on to their destinations all through the country, via a network of many faith communities. They’ve been doing this work for over forty years. Jewish Family Services (JFS) in San Diego just recently started taking the lead in San Diego doing similar work. Act – Find an organization locally, in your city or county, and see if you can volunteer. If you speak Spanish, have a legal background, or just want to show up in court and support individuals, there is plenty to do. If you are at Temple Isaiah in Lafayette with me, look for upcoming messages on how we are getting involved in supporting our local immigrant communities. 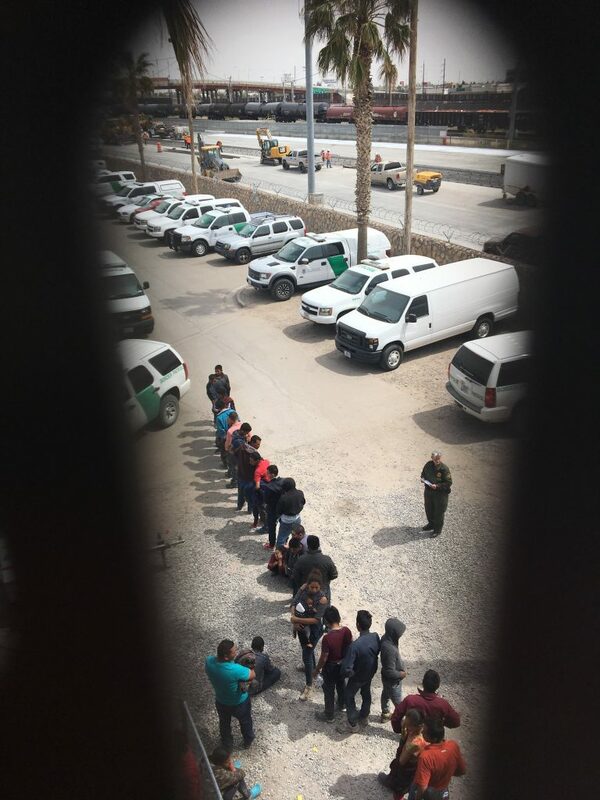 Click here to read about my experience on the El Paso Border Trip Day 1 and Day 2.